Will Maine libertarians show Rand Paul same love his father won? Republican 2016 U.S. presidential candidate U.S. Sen. Rand Paul answers a question at the first official Republican presidential candidates debate of the 2016 U.S. presidential campaign in Cleveland, Ohio, Aug. 6, 2015. AUGUSTA, Maine — Republican presidential candidate Rand Paul announced this week that he will visit Maine on Tuesday during a swing through northern New England that will also include stops in New Hampshire and Vermont. Paul’s reasons for going to New Hampshire, which holds the first presidential primary in the nation, is obvious. But why Maine? It could be because Maine provided one of the high points for the candidacy of Ron Paul, Rand’s father, during the 2012 election. Maine was thrust into the national headlines in 2012 when Ron Paul’s supporters essentially hijacked the Republican State Convention, naming 21 of Maine’s 24 delegates to the Republican National Convention at a time when Mitt Romney had all but sewn up the nomination. For many, it was a first experience in organized politics, as they worked to propel the Maine Republican Party rightward and closer to the libertarian principles often linked to what was then a growing national Tea Party movement. The chaos continued at the 2012 Republican National Convention in Florida, three years ago this month, when the legitimacy of Maine’s Paul supporters was called into question because of irregularities and procedural violations at the state convention. The Pine Tree State was the subject of national headlines for days as a furor erupted over whether Maine’s Ron Paul delegates would be seated at the national convention. In the end, an RNC committee ruled that half of Maine’s Paul supporters would not be seated — and would be replaced by 10 Romney supporters — which spurred most of Maine’s delegates, including Gov. Paul LePage, to boycott the rest of the convention. The whole string of events widened ideological and political cracks that had already been evident in the Republican Party. In 2013, a dozen well-known Republicans announced publicly that they were leaving the party, citing the convention fracas as one of their top concerns. That followed the November 2012 decision not to seek re-election by then-GOP state Chairman Charlie Webster. When Rick Bennett was eventually elected GOP state chairman in July 2013 — after the short, tumultuous reign of Richard Cebra — he said part of his mission was to bring the party back together — finding a place within Maine’s GOP for Ron Paul supporters. … though Ron Paul did well in the caucuses. Ron Paul staged a convincing run at Romney in Maine’s non-binding caucuses in February 2012, amassing 36 percent support versus Romney’s 39 percent. To date, Kentucky Sen. Rand Paul — a featured guest speaker at the 2014 Maine Republican Convention — has not generated the fervid personal loyalty or ideological enthusiasm nationally or in Maine among small-government, libertarian activists that marked his father’s 2012 campaign. He also is being forced into a fight for libertarians against Ted Cruz, a U.S. senator from Texas, the state where Ron Paul launched his political career. So far, according to an average of several polls compiled by Real Clear Politics, Cruz is beating Paul in the polls, though neither is very close to the front-runners. To some degree, Rand is a chip off the old block, though perhaps not as dedicated to libertarian principles, according to reports such as a recent Politico analysis. He has been seen as leaning slightly toward the center as a senator on some issues, such as foreign policy in Iraq and Ukraine, and a government-aided revival of struggling cities like Detroit. 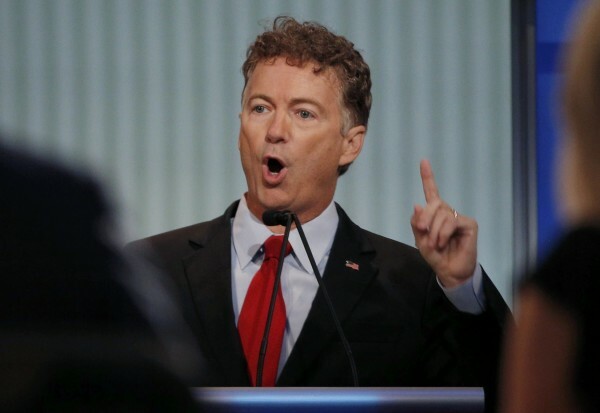 As the presidential race accelerates, Paul has veered back toward anti-government ideals he is more well known for, such as fighting against the reauthorization of the Patriot Act earlier this year with a lengthy filibuster and sponsoring a bill in the Senate that would let states legalize medical marijuana without federal interference. But that doesn’t satisfy some. Landon St. Peter of Oakland, one of the Ron Paul delegates who was forced out of the 2012 Republican National Convention, said that if Rand Paul was a true libertarian, he would be running as one, not as a Republican. Sen. Eric Brakey, R-Auburn, who was Ron Paul’s Maine organizer in 2012, said his support is now fully behind the younger Paul. During an appearance at the 2014 Republican State Convention, Rand Paul used his keynote address to try to pull together GOP factions. In January of 2012, Ron Paul came to Freeport and spoke from the balcony of Linda Bean’s lobster restaurant on Main Street. The size of the crowd — estimated at around 1,000 people — shut down Main Street. It was the first signal that the elder Paul had galvanized a more visible libertarian movement in Maine. On Tuesday, Rand Paul will hope to re-create that scene, again at Linda Bean’s Perfect Maine Kitchen and Topside Tavern. For Vic Berardelli of Newburgh, a political analyst for the Bangor Daily News who is the former chairman of the Maine Republican Liberty Caucus, Tuesday’s event in Freeport will be a major test for the younger Paul. The success of self-described “personal freedom” candidates in recent elections, including LePage, Brakey and 2nd District U.S. Rep. Bruce Poliquin, has shown that Maine has a strong libertarian streak. Regardless, whether Rand Paul can pick up where his father left off, and perhaps count on Maine during the next Republican National Convention, remains to be seen.